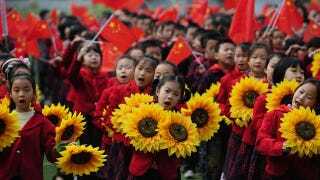 Is China selectively breeding a new generation of genius babies? There's a provocative and somewhat disturbing article over at Vice about China's recent foray into genetics and the country's unabashed attempt to boost the collective IQ of its citizens. In it, Aleks Eror interviews NYU evolutionary psychologist Geoffrey Miller, who donated DNA to help a Chinese biotech firm identify the genetic markers for intelligence. According to Miller, BGI Shenzhen has already collected DNA samples from 2,000 of the world's smartest people. It's now hard at work sequencing these genomes to identify the alleles that determine human intelligence. Once complete, Chinese parents will be able to engage in what's called preimplantation genetic diagnosis (PGD) in order to select the most "intelligent" babies. It's not genetic engineering — instead, doctors look at the DNA of several zygotes and choose the most promising one for implantation. Put this reproductive technology in the hands of enough parents, and the next generation of Chinese citizens could start to exhibit rates of intelligence five to 15 IQ points higher than what's typically seen today. Of course, as Miller makes clear in the interview, intelligence is the result of many different genes and DNA regions interacting. It may prove almost impossible to identify genetic markers for intelligence — it would be much easier, for example to select for physical traits or even character traits like being industrious. This law regulates support for maternal and child health and also requires physicians to recommend a postponement of marriage if either member of a couple has an infectious, contagious disease or an active mental disorder. If one member of a couple has a serious hereditary disease, the couple may only marry if they agree to use longterm contraception or to undergo sterilization. If prenatal tests reveal that a fetus has a serious hereditary disease or serious deformity, the physician must advise the pregnant woman to have an abortion, and the law states that the pregnant woman "should" follow this recommendation. The introduction of novel biotechnologies could allow the communist government to take its eugenic-like policies to the next level (though it's not clear at this time if China will insist that PGD be enforced in this way). But rather than just screen for a "serious deformity," the Chinese may eventually designate any kind of "deleterious" trait — like low IQ — as something that can and should be eliminated from the gene pool (with "low" IQ being a potentially normative and scalable characteristic). Read Eror's entire article at Vice.